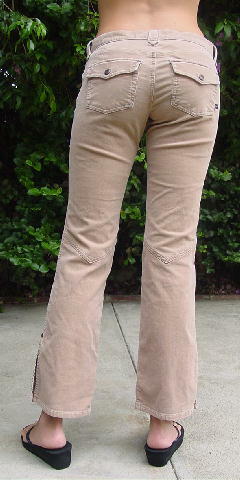 These light tan stretch low rise cord pants are by Abercrombie & Fitch and are 98% cotton and 2% spandex. There is a 3 1/4" zipper fly. The front has two open pockets with a logo rivet on each and the back has two metal one logo button flap pockets. The right pocket has a black tag with A&F on its side. The waistband has a logo button closure and belt loops. 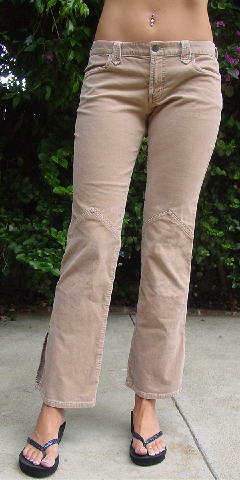 The leg bottoms have 6 3/4" outer side seam slits with a logo rivet at the top of each slit. The tag says size 6, but they fit more like a size 4.